The Solenoid Seeker helps you find operating solenoid valves in garden beds, mulch and turf areas, whether they are directly buried or in a valve box, the SS2002 will find them. A must for all irrigation maintenance contractors; save time and money by finding your solenoids fast. The Pro800 Cable Locator is a new low cost locator for contractors and maintenance personnel. Incorporating a transmitter and sensitive receiver, the Pro800 tracks many types of cabling including CATV, electrical, telephone and lighting. The Pro800 transmits an easy to follow beep signal that is tracked by the receiver. 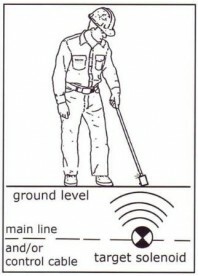 Simply connect the transmitter to the ground stake and the wire to be tracked and turn on, following the beeps with the receiver using either the visual meter or external speaker. Included in the unit is a wireless broadcast mode that means inducing the tracing signal through the ground, allowing the user to trace any conductor in the ground within a 7-9 metre radius.